Heat over to 400 degrees F. Spray 15x10x1 inch pan (I used a cookie sheet) with cooking spray. In a skillet, heat vegetable oil. Add in the onion and cook 2-3 minutes. Add the corn and cook 3-4 minutes. Stir in chicken and remove from heat. Stir in the sour cream and ½ cup of the cheese. Let this cool for about 5 minutes. Unroll the pizza crust dough into the pan. Starting at the center, press dough into a 10 inch square. 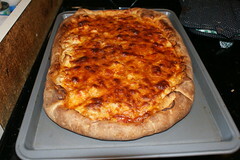 Spread about 2 tbsp of the enchilada sauce over the dough. Spoon the chicken mixture evenly over the sauce to within 2 inches of the edge. 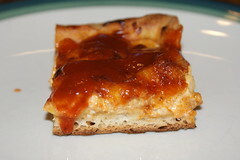 Then drizzle about ¼ cup of enchilada sauce over the chicken mixture and sprinkle the remaining cup of cheese. Fold the edges of dough up over the filling and round the corners. Bake about 20 - 25 minutes or until the crust is brown and filling is bubbly (I slightly overcooked mine -- Even I mess up these easy to cook recipes sometimes! LOL) Let the tart stand for about 10 minutes. Meanwhile, heat the remaining enchilada sauce. To serve, top tart with chopped Roma tomatoes and shredded lettuce. Cut into wedges and serve with the warmed up enchilada sauce.